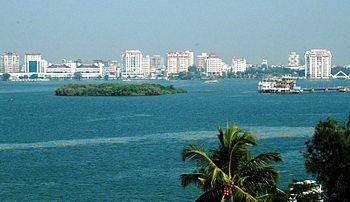 Kochi also known as Cochin is a major port city on the south-west coast of India bordering the Laccadive Sea. It is part of the district of Ernakulam in the state of Kerala and is often referred to as Ernakulam. As of 2011, the city has a corporation limit population of 677,381 within an area of 94.88 km² and a total urban population of more than of 2.1 million within an area of 440 km², making it the largest and the most populous metropolitan area in Kerala. Kochi city is also part of the Greater Cochin region and is classified as a Tier-II city by the Government of India. The civic body that governs the city is the Kochi Municipal Corporation, which was constituted in the year 1967, and the statutory bodies that oversee its development are the Greater Cochin Development Authority (GCDA) and the Goshree Islands Development Authority (GIDA).